I've sent out the email to the Clan Wars dude. Due to changing circumstances, CULT|icycalm will no longer be able to be the clan's point of contact for Clan Wars. Please direct all communications and inquiries to this email address. As for re-submitting The Cult's system, Cult Prime, I have uploaded an updated version to the Default Server under the name CULT|recoil. Hopefully, they're not dicks about the change, lol. Nah, I am sure they'll love not having to deal with me any more. Should have done it sooner. Quitch wrote: A bug in the system editor has been identified which led to all planets being marked as starting planets (regardless of the original design). As this was a bug in the game which caused an error to be introduced during the transfer of the system by eXodus, and given the time between now and your game against them, the Voices of War home system has been re-uploaded to the Clan Wars folder. This reduces the number of starting planets to 2, as originally intended. Also, our next game will be on November 22 at 18:00 UTC vs. Promethean. They gave us a choice between November 1, 8, and 22, but I picked the furthest date to give us more time to improve, and I say we follow the same tactic for all future matches. I think by the time the first season ends we'll be reasonably close to everyone else's level, and then several new clans will enter the fray for season 2, so we'll get the chance to be competitive eventually if we hang in there until then. With recoil as our point of contact now, our chances of making it that far have just considerably improved. Offline mode is now in the PTE (=beta, for those who don't know), which also includes improvements that allow far more units to be in play than before without the server lagging. If you add in the fact that the ability to set up (or rent) our own online servers is also coming soon, this means that 10v10 and above games will soon be possible, so to all those who've been dabbling with the game, now would be a good time to get more heavily into it so that you'll be ready to join us for the bigger games, when they become available. I'll be online playing PA later tonight. Hopefully we'll manage to get the whole team together for some practice, but if not I'll play with whoever is online. Dying to check out how the latest build handles large armies. And remember: we will all have to be online and in the Exodus IRC at least half an hour before the match. What I was suppose to be doing fell through for tomorrow, so I'm free as an alternate if anyone else on the team has something come up unexpectedly. Well, jeff's going to have to step down then. Sorry jeff, and thanks for volunteering to play. Hopefully though either jeff or other people will be online tomorrow just in case something unexpectedly happens to one of us. After the matches, whoever sticks around can play with us. We'll divide up into as many teams as necessary so that everyone can play. I'll be making a post in the Strategy thread later tonight, so make sure you've read it before coming online tomorrow. I am up early for practice, and I'll be playing in 10 minutes with ksevcov. Whoever wants to help me warm up, come on Mumble. The more the better, up to 4v4. Also, if anyone plans to be watching the stream, please go in the chat and stay there from beginning to end, so you can copy-paste and email the chat log to me. I am just curious as to what people will make of our strategies (both of which will be veeeeery different from what everyone else has been doing so far in the tournament). I hope we'll put on a good show for people. I think we might be able to. I'd come practise with you guys, but I'm away from the computer for the next few days. I guess I should look into getting a laptop for these occasions. We've completed our first round of fixtures and I think we can all agree it's been a great success so far. Of course, this is new to all of us so we've decided a couple of areas need revising. 1. Clan Wars has helped to drive the growth of certain clans and here, at the end of our first round of fixtures, we will be allowing each clan to draft two additional players to their roster. Anyone you wish to add should register an account with eXodus, please then send me their eXodus account name. 2. I think we've seen that home systems have undergone varying levels of testing, and some clans have encountered performance issues they didn't expect. Therefore we will be allowing a one-time only system redesign. These systems must work within the existing rules, but other than that can be as close to or as different to your current home system as you like. If you're happy with your current system there's no need to resubmit. Any new players or system updates must be submitted by midnight on the 26th October. You can read the whole thread, or you can start at the post that I linked, if you don't have the time. There are many posts in that thread by me, totaling several thousand words, a good portion of which will be copy-pasted verbatim in my review of the game, so read it if you want to understand the genius of PA, especially if you are a doofus from Learn to Counter who listens to that inane dribble that that poser Lowell is peddling. By the way, the LTC clowns should make a clan and play against us, even if Lowell doesn't want to join it. Just send me a friend invite on Steam once you have the team, and I'll message you when I see you online to play. I wrote: Can you set up a custom server for my clan on Amazon? I know absolutely nothing about servers or Linux or any of that stuff. But I have a pretty deep wallet, and I am willing to pay some money to get a custom Cult server up like the one you were using the other day, as soon as possible. Like today, if possible. Can you help me with this? I could buy you a couple games off your Steam wishlist as thanks for your time. Just take care of all the technical stuff for me, let me know if I have to make an Amazon account or something, and give me my log in details when the entire thing is done. I just find the huge FFA games boring, and I want to play huge team games. But no one is setting those up (and moreover not at the times when my clan is all available), and it's driving me nuts. Please help, if you have the time and if you can. If he does it it'll be awesome, because we'll be the first clan with a custom server. It will say "Cult Server" in the list of games in the lobby, and it'll be a great advertisement for the clan. More importantly, we'll be able to play 10v10s or 7v7v7v7s or whatever RIGHT NOW. So fingers crossed this works out. It's happening! I made the Amazon Web Services account and sent the log in details to colin to set up the server. It all depends on whether he has free time today, but considering how quickly he's been replying to my messages he probably has. It takes about 25 minutes to set up the server every time you want to play, but he says he can write a FAQ for me and get it down to 10. So every time we want to play big games on our server, I'll have to prepare for 10 minutes to make it happen. It's either that, or pay thousands of dollars a year at $1 an hour to keep the server running 24/7. (Of course I'll still have to pay $1 an hour when we play by this method, but the amount will be far more manageable). I offered him 100 euros for his help in setting everything up. So overall, it's not a cheap endeavor, but I am happy to spend all y'alls sub fees to make it happen. In the long run there will also be an option to "deep store" the server, so that we won't have to do the 10-minute setting up before every session. On the negative side, however, if Uber makes even small changes to how the server works between updates, they could render colin's FAQ for me useless, forcing him to write a new one because I am an idiot who knows nothing about servers or Linux. So, quite a few costs and headaches overall, but I believe the result will be worth it. In the VERY long term Uber will officially support custom servers and we'll be able to rent one on a monthly basis with no hassles beyond the monthly fee. The server will be up within the next half hour! Whether clan member or not, whether friend or foe, join us online for Awesome! colin helped us set up our clan's custom server on Amazon, and it will be running from now on whenever we are online and want to play a large game. We only play team games, usually 5v5v5s, but bigger ones too with more and bigger teams, as long as there are enough players who want to join. Everyone is welcome. 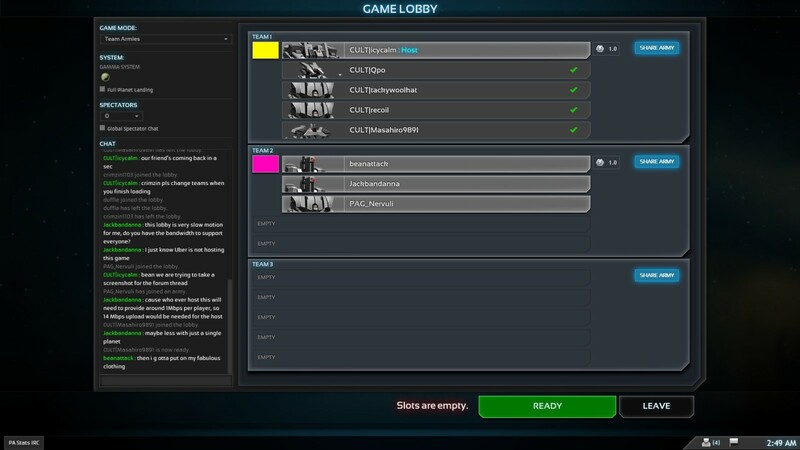 We want to use this server to promote team games and clan creation, because we believe this is the best way to enjoy PA.
Our first lobby is up right now, and we're looking for players. Jump in if you're game. We can't wait to keep getting bigger and bigger games with you guys. 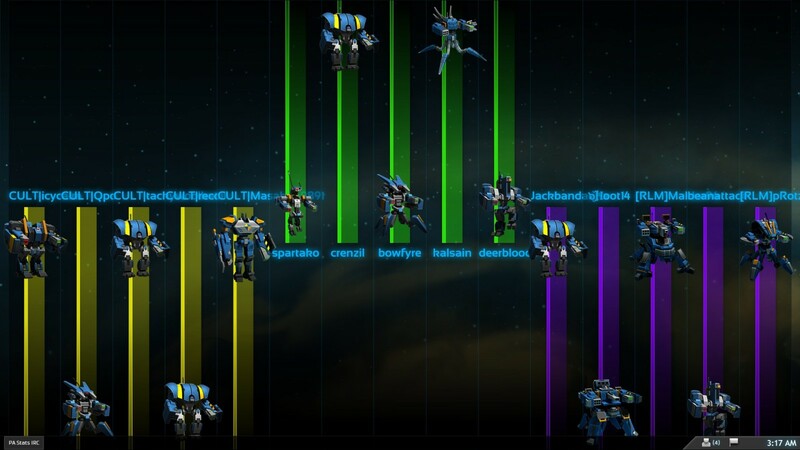 Hopefully in the near future we can have a 5v5v5v5. With the custom server we can now basically do as many players and as large planets as we want. We can have 1000 players and a planet the size of Earth if we want. The game will crash of course, but it can be done by changing a couple of numbers in a text file. So even if Uber goes bankrupt tomorrow (knock on wood), and they never improve the sim speed or anything else, we will still be able to play these gigantic games when server speed, memory and bandwidth reach the necessary values, whatever these may be. 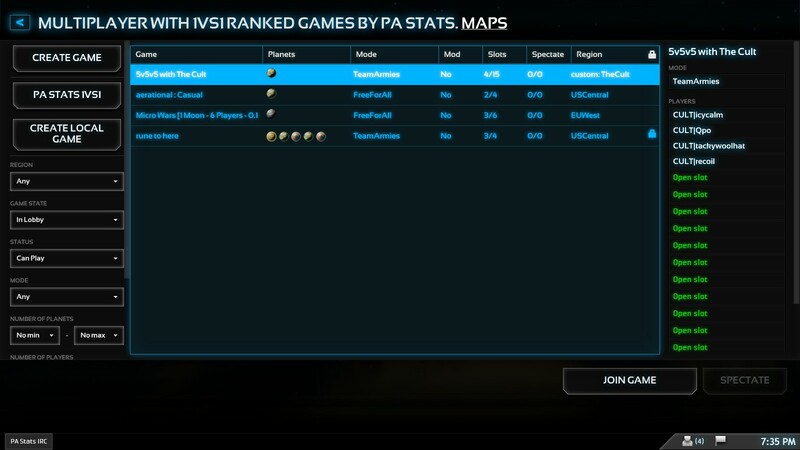 It's funny that the PA forum dudes make a big deal out of server costs. Compared to a typical evening in an arcade, custom PA server costs are negligible. In an arcade you pay, what? A dollar for 15 minutes on average? And that's a single person. But here it's like $2 for the fast server for an hour for 15 people (or 30 people, or more if you can find them). It's nothing. 15 people in an arcade for an hour would have to spend at least $15, if they are world record holders. Otherwise more like $30 or $40 at the least. And 15-player PA is so much better than any arcade game ever it's not even funny. First person/clan to donate too (check at the very top of that post). 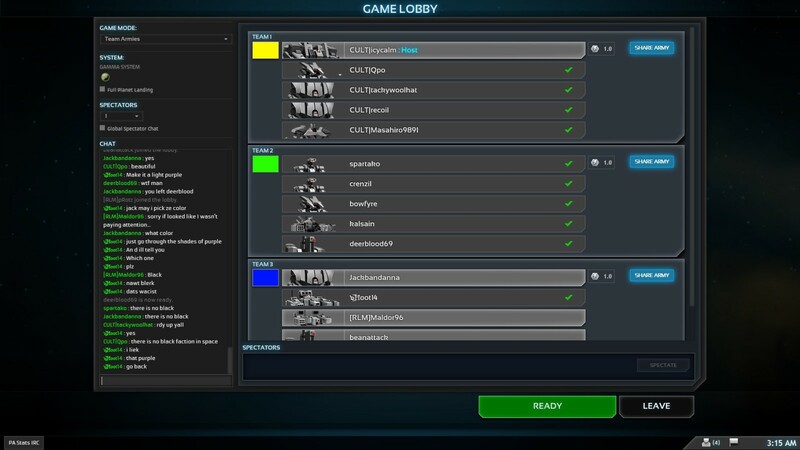 By the way, this is why our custom lobbies fill out so slowly. Because only people with PA Stats can see them, which is a tiny fraction of the playerbase. In light of that it is almost a miracle we managed to get a game going at all, so from now on we'll try to run those only on peak times (no idea what those are exactly, but weekends sound like a good idea). I made the change to the system and sent the email to Quitch. I wrote: A heads up to the other clans. We've increased the size of our home planet to 1300 (from 850 or 950 previously, can't remember exactly how much it was). We chose the smaller size to start with because of sim performance issues back when Clan Wars was announced, but now that the sim has been vastly improved, we think that 1300-size planets are playable, and as the season moves along, and sim performance is further improved, and Exodus perhaps also moves the league to a custom server (we'll happily volunteer ours for free, btw, even for fixtures that don't involve us -- colin says it's faster than Uber's, and we won't have to share it with 7 other lobbies), it'll only get more and more playable. Strategy-wise reptarking/Gandalf has pointed out to us that a smaller planet would work better for us with our current strategy, but we like huge battlefields and huge armies so much that we went ahead and increased our planet's size regardless. We'll just have to do our best to adapt, and we're already trying out modifications to our strategy and alternative strategies. We are all very much looking forward to facing Promethean on November 22nd.